We are so pleased to bring you the final interview we recorded at the SCBWI conference in LA this summer: Kevin Emerson, author of the super-exciting Atlanteans series! In addition to being a talented writer, Kevin is just about the nicest guy ever. 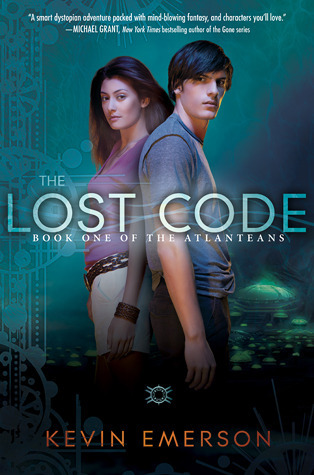 We had a blast talking to him about his inspiration for the first book in the series, The Lost Code, his experiences at summer camp as compared to those of his characters, and what it was like to transition from writing for younger readers to writing YA. Enjoy! Visit Kevin at his website to learn more about The Lost Code and his upcoming books, and be sure to stop by Katherine Tegen Books, too. We are also excited to announce the winner of our "Ask a question, win some books!" giveaway. Allison K, you are our winner! Be sure to drop us a line to claim your prize. Didn't win? Don't be sad! You can win a signed ARC of The Lost Code. We've just got to know... if you could have a super power, what would it be? Leave us a comment with your Twitter name or a way to reach you. You have until January 17th to enter. Must be a US resident or willing to cover shipping charges. A winner will be selected by random.org. Podcast hosting courtesy of archive.org. Intro music by 46bliss. Special thanks to our sound engineer, Marc Conrad Tabula, for his awesome audio editing skills. Please subscribe to Authors are ROCKSTARS! on iTunes so you'll never miss an episode-- and we'd be so grateful if you're inclined to leave a review. Hope your new year is off to a great start! This sounds like an Awesome book, I would totally want the power to see into the future or read minds. But in retrospect I would want Piper's (From Charmed)powers. My super power would be telepathy/telekenesis. :) I feel like those two should go hand-in-hand.